Introducing this beautiful warm home sitting pretty on a gorgeous 4413m2 (1.1 acre) section. 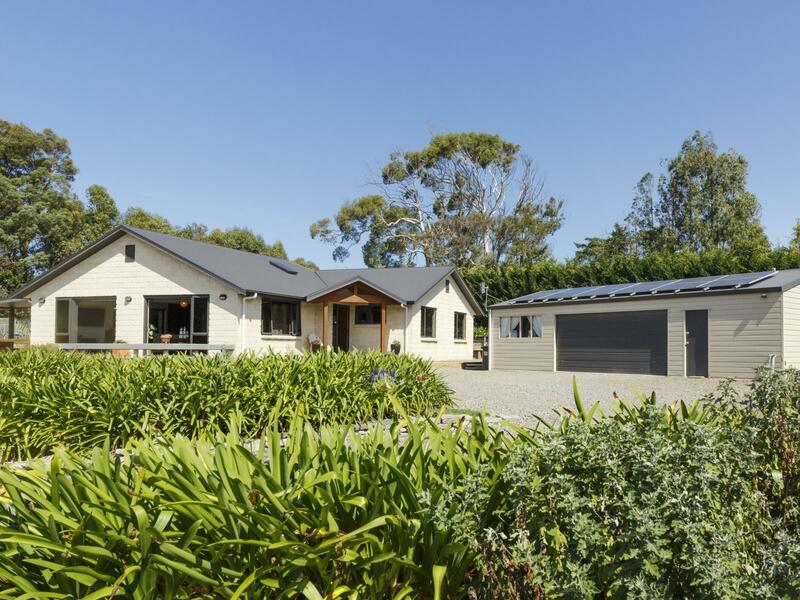 Room for the pet lamb, grow your own veges and relax in the 175m2 home with wonderfully huge, wrap around decking! You will enjoy the established easy-care gardens and flat lawn areas for the family and pets. Only a quick drive to the city and local schools are very handy. This trendy property is like sparkling new being only five years old and has the kitchen as the heart of the home with great open plan living with double wall oven, dish draws also granite top island and benches plus log fire for cosy winter warmth. There are three double bedrooms and a fourth bedroom/office/or second living area. The master has ensuite with WIW and there is a spacious laundry and family bathroom. Now here are the other huge benefits which will dramatically reduce monthly power costs: twelve solar panels, wet back fireplace for hot water and fully double glazed. Super bonus is the additional 4 bay garage/shed suitable for all the vehicles and plenty of room for a great workshop/hobby area. The rain water storage tank and also trickle feed town water allocation is like gold on a lifestyle property such as this. Make a great choice and enjoy easy lifestyle living, call me now to view this lovely property. CHATTELS Blinds | Light fittings | Auto Garage Door Opener and 1 Remote | Clothesline | Dishwasher | Electric Stove | Extractor Fan | Fixed floor coverings | Garden Shed | Mirrors | Security Lighting | Security System (Monitored) | Smoke Detectors (hard wired) | TV Aerial | Washing Machine Taps | Double Oven | Granite Work Island | 12 Solar Panels | Speakers in Ceiling | Kitchen - heat detector.